One of the challenges with running Critiki is keeping the information up-to-date. In particular, keeping the operating hours current has been a hard problem. Some places never change their operating hours (looking at you, you glorious 24-hour Vegas kids). Other places seem to change around which days they’re open at all (looking at you, Tonga Room, you little minx). Every business needs the flexibility to change their hours. 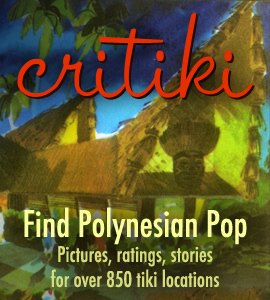 Critiki’s goal is to bring people and places together, and to that end, I’m going to make it easier for the tiki bar owners to make sure I’m not putting out stale info. Starting today, business owners can get special access to update their place’s hours in Critiki themselves. If you own a business that is listed in Critiki, get in touch! Send me an email at humuhumu@critiki.com. That’s not all… Critiki member kenbo-jitsu has also volunteered to help keep the hours current. This is going to be a huge help. Mahalo nui loa, kenbo-jitsu! If you’d like more information on how Critiki can help you as a tiki business owner, read on at Critiki!